The border crossing was a pleasure! We were done with formalities in moments, no searches or restrictions at all, so Solveig didn’t need to have gone to so much trouble hiding her cartons of cigarettes in strange places all over the car!! We were in Mozambique! The new tar road welcomed us but the lack of signage and the GPS confused, we were left to our instincts. We followed the tar northwards for a few kilometers until we reached a tarred turnoff to the right and took that. After another few kilometers we came across roadworks which confirmed we were on the correct road to the sea. Soon we were driving down a street lined with vendors selling everything imaginable. We stopped to purchase a data sim and beers as we’d been advised not to bring in any from home. 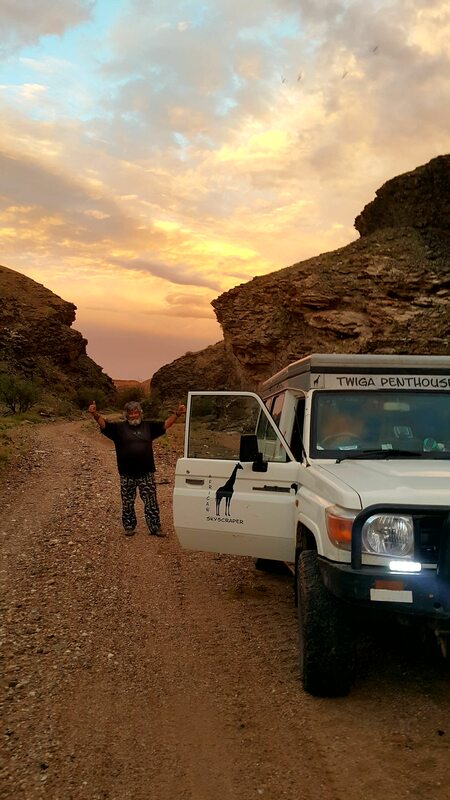 We met Jan from Palm Tree Lodge who had brought in a number of backpackers and clients who’d left their vehicles at Palm Tree lodge. I made the purchases (all in SA Rand) while Solveig checked out the stalls. Carrying on down the main road we reached the campsite at the beach. We’d figured on spending a night in Ponta before moving on. The campsite was undergoing an attempt at painting the ablutions in the quiet season which put them out of service. There was more paint on the floor than the walls and we were asked to use the facilities at the cottages. But it didn’t spoil our stay at all and we could easily see why the resort is so popular. The sites close to the beach ( sandy) were R380 per night while the site we chose on grass 20 meters away was only R190 per night. The easy access via the new tar road will make it even more so. Luckily it was full moon and spring tide receded enough to expose a stunning reef. The weather was wonderful, but the sea not as warm as expected. We explored the reef and beach for shells. Besides birds there were a number of colourful lizards all over the campsite. The next day we moved to Parque de Malongane at Ponta Malongane, a few kilometres further north on a 4×4 track with deep sand. The shaded campsite was very sheltered from the afternoon sea-breeze, but sandy. We struggled to get Twiga positioned between the trees with enough space for our Penthouse. R200 per night. We awoke to a miserable day as the bad weather we’d experienced along the coast finally caught up to us. We spent the day tidying up our photos and travel notes. The long white beach must be a wonderful sight in summer to holiday makers from inland. The following day we decided to move north of Maputo as the weather report indicated the cold front had moved out to sea there. We returned to the new tar road and headed north rapidly covering the distance to the outskirts of Maputo which could have taken virtually all day before. When we reached Boane we found a Shoprite and stocked up with items we’d not brought with us in case they were confiscated at the border. We needed a coffee and something to nibble on and visited a bakery in the centre where we found they had Natas, a Portuguese egg custard tart to die for! As it was a Sunday with very little traffic we took the EN1 to Marrcuene north of Maputo. The villages along our route had stalls selling clothing, vegatables and curios. We were back in Africa! We had chosen to stay at Tan ‘n Biki at Praia Da Macanela, run by ex South Africans for R340 per night. Practically on the beach, the sites were secluded in coastal scrub on the dunes. There were also chalets and a pub/restaurant. For the campers unisex ablutions made a change, yahoo! a shower for two……. The place was well cared for and had nicely layed out gardens. Tan ‘n Biki was a lovely place, but tanning not possible as the weather was not doing its part, so we chose to move on. Before leaving I topped up on data, surprised that ours was already depleted, and also surprised at what we’d paid for our data in Ponta do Ouro!! It was so much cheaper here. We have many friends to thank for all the tips we’d received regarding places to visit and stay, especially Meryl who supplied us with typed notes, and Andre and Estelle, of course. We also read well written articles in the excellent and informative travel and outdoor magazines available to us in South Africa. DriveMoz, an online Facebook Group is also a must for visitors to Mozambique. The next few days were spent at Complexo Palmeiras in Bilene. We’d found a place we could relax at and the weather was great! In fact, it was very hot! We took long walks on the beach in both directions. The local community were wonderful and friendly, going about their lives without hastling us. We took a walk into the town and stopped at a roadside pub. I had a 2M local beer and Solveig an R&R – a local rum with Sparletta Marango (Sparberry). The weather was ideal to fly the drone but like a computer, every time you wish to use it, it wants to do an update first! Difficult with a limited internet, only 2G most of the time. We were doing so little, except lots of walking, and although we weren’t used to it we actually enjoyed it! Getting up late and going to bed early and really relaxing in between with a few more 2M’s and R&R’s! After 3 days of this we felt guilty and decided we had to move on northwards again! A couple we’d met at Bilene were celebrating their honeymoon. They weren’t taking any chances, they only got married after their children had left home! They suggested we should stay at White Sands Lodge when in the Inhambane area. But that was still a long way off at the pace we were travelling. There were a number of lodges that also offered camping too. We found a place near Xai-Xai beach. Montego was a lovely creative campsite. Located on the dunes a few meters from the beach on the northern side of Xai Xai beach. The friendly owners gave us lots of advice regarding where else to stay and other travel tips. Besides the deck with sea views, there was a beach side pub. Once again, we were the only campers! The beach was stunning with a reef which was exposed at low tide. We enjoyed our long walks each day, the excellent weather and beautiful beaches made it especially enjoyable. After two nights we moved on to Zavora Lodge. It was difficult to find because of incorrect information on our T4A GPS map!! Fortunately, I’d seen a sign to Zavora about 10 kilometers before, so we turned back. When we arrived we were met by a flustered manager who pointed out the location of campsites on the dunes and asked us to make ourselves comfortable and handle the formalities later as there were police at the reception. The campsites are at two locations. A few on the dunes alongside the chalets, and others behind the dunes next to a lake filled with reeds. The following day we found out that a diver had been lost the previous day which explained our troubled host on arrival. A tourist from Italy in her thirties was deep diving on Heliox about two kilometers from shore with a party of divers. Her husband had been her buddy when she went missing! Search parties and a helicopter were out all day searching for any signs of the missing tourist. We were very lucky with our weather while SA was experiencing a harsh cold front with plenty of snow everywhere. More lazy walks along the beach and time spent exploring the exposed reefs…. By the time we left the diver had not yet been found. It was Zavora Lodge’s first accident of this nature in the 10 years they’d been operating a dive resort. On our arrival we first explored the town of Inhambane before visiting the resort of Tofo where Estelle and Andre share a cottage with a few others. Tofo is a busy tourist town and we were thankful we were staying at White Sands nearby. There were traders trying hard to make a sale and we were continually being hassled. We preferred quieter venues! One of the restaurant owners and concerned residents of Tofo had organised a beach cleanup and the result of that was this turtle made from bottles they’d picked up! As Solveig doesn’t eat fish we’d avoided visiting a seafood restaurant before, but I was very keen to have some prawns and as we were in Tofo I just had to try. What a disaster!! Firstly they didn’t have any! We should have left but were already busy with our drinks, so I ordered Lulas and Solveig ordered a Prego. The worst calamari I’ve ever had! The chips were OK but Solveig didn’t enjoy her Prego either! We then headed to White Sands where we’d stay for the next few days. Entrance to White Sands at high tide. We were cut off for two and a half hours! We arrived just in time to avoid being cut off by the high spring tide. We were basically on an island. The following day the tide had receded by hundreds of meters. Fish traps, in the other direction, with our campsite in the distance behind the palms at low tide. Our island campsite at White Sands. We spent the days exploring the “island” we were on. The local community offered excursions on their dhows to Pansy Island where you could pick up pansy shells if you got lucky. We took our chances here at White Sands without any luck! Estelle had insisted that we stay at Morrungulo although she didn’t have much information other than it was a well kept secret! T4A maps also didn’t know too much about it as it missed the turnoff by about 10kms! Luckily I’d seen a sign to Sylvia Shoal Morrungulo, so we turned back and took that road. There was quite a bit of repair work being done so we were grateful to see another sign closer to the sea. Sylvia Shoal was off to the left of the road we were on and every now and again another sign greeted us. When we thought we’d almost reached our destination the signs stopped. We then took every turn but always landed up on private property. It was getting dark and we started to get anxious. We eventually came across a lodge that was undergoing renovations and asked them for directions. We were instructed to go to the bottom of the hill and turn right over a dune. There we found a boom which Solveig lifted and we went in. Not a soul in sight, it appeared to be deserted. On investigating further it turned out to be the correct place. We chose to wild camp there anyway as it was now almost dark. There was no water nor electricity, but we could cope. Early in the morning we were woken by the sound of grass being cut. There was a man there who was looking after the place. It had recently been sold and the new owner was arriving in a week or so! We returned to the lodge on the hill that was being renovated and found a young couple there that were the new managers. It seemed that there were lots of property deals taking place in the area! The couple introduced themselves as Jessica and Lloyd from J-Bay. Lloyd told us he had been fishing on the chokka boats in J-Bay. I said we’d met a chokka boat fisherman and surfer from J-Bay in Costa Rica at Puerto Veijo de Talamanca named Lookie. What a small world we live in….They were friends!! Lloyd took a photo of us all together and whatsapped it to him! They could not accommodate us but gave us directions to Morrugulo Lodge further down the coast. The campsite had grassed stands and was practically on the beach. We would never have found this place without the effort we’d gone through and would have given up had Estelle not insisted that we stay here. Solveig looking a little nervous! There were palms everywhere as well as other campers for a change. Most of them we spoke to were from Zimbabwe taking a break until the post election fun and games settled down. 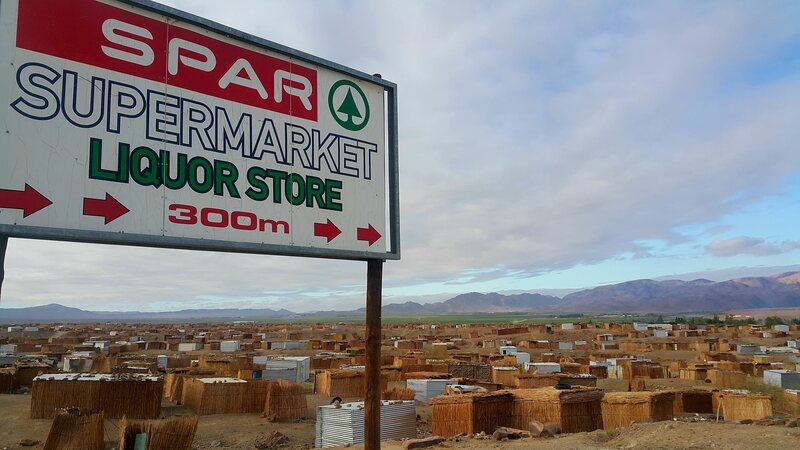 Prices had also escalated there…..over R120 for 500 gram butter and fuel at around R22.00 per liter! One lady suggested it was not a good time for us to be travelling there. We’d have to find a different way home. I posted on DriveMoz for suggestions. While on the DriveMoz site I read that the missing diver at Zavora had been found by an experienced diving team and no foul play was expected. But we were here to enjoy ourselves and there was still lots to see before our homeward journey. Another day of long walks on the pristine beach at low tide…. We had been advised to stay at Baobab Backpackers but wanted to check a few alternatives and do some shopping first. It was already Saturday afternoon and everything was closed until Monday! We still had food so it wasn’t a real problem. We stopped at a restaurant overlooking the beach for coffee and de natas. We were happy that we had chosen Baobab Backpackers. It seemed better than the others we’d seen. There was plenty to see and do…. Signs advertising restaurants and activities. The beach front was where it was all happening.Scores of resaurants, pubs and informal traders selling mainly beach clothing and curios. Low tide was the best time for photographs with dozens of channels of water separated by sandbars. across the bay you could see the islands of Bazaruto, Ilha de Benguerra and Ilha de Santa Carolina. There were a number of tour operators running Dhow services to the islands situated along the beachfront. There was everything you could immagine to do or rent. Just walking the beach and interacting with the locals was good enough for us. In the the campsite we also interacted with people young and old from all over. We found an Airush Kite Surfing school and saw a number of Kite surfers. Conditions were near perfect as there was nearly always an onshore wind in the afternoons. We had made a decision to carry on to Inhassoro for a few days and then turn around and exit Mozambique via the Pafuri border in the north of the KNP. It was a two day trip of approximately 500 kilometers which started about 35 kilometers south of here. 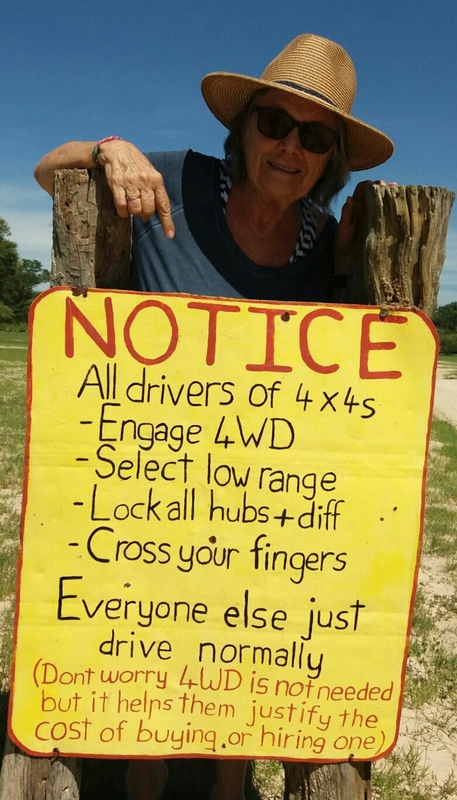 DriveMoz had confirmed that crossing the Limpopo would not be a problem as the river was extremely low. The EN1 road north between Vilanculo and Inhassoro was shocking. Potholes reminesent of the Livingstone/Sesheki road in Zambia. The first thing we did on arrival was visit a supermarket owned by a South African that stocked all our home favourites. We restocked with the essentials, mainly of the liquid kind. He never had bread as he did not want to compete with the local bakery across the road. We followed a foreign registered motorhome down a corrugated gravel road for a few kilometers, they also seemed to be heading for Goody Villas Campsite. When we arrived there were eight other Motorhomes already there! A group of European tourists had shipped their vehicles to Port Elizabeth and were going as far as Kilimanjaro, visiting all the countries on the way, finishing in Namibia on their return south. Goody’s was one of our favourite campsites and Inhassoro a wonderful destination too. We’re so glad we came this far north as we almost turned inland near Vilanculo. The local community depends largly on trek fishing for their protein intake. The nets are taken out over the reef by row boats and then a large number of the community are involved in pulling in the catch. Young and old all play a part. The stronger members do the pulling…. while the children roll up the coils of rope. She’d threaded these on seaweed! There were those we’d never seen before! A large variety of seacreatures are caught in the nets, including Turtles which are immediately released. Even huge Crayfish weighing up to 3kgs are netted! Solveig loves the connection, especially with the children. All too soon we were on our way again, but we hoped to be back soon as there is so much more to see. We hadn’t even reached the halfway point! Unfortunately we had to retrace our steps through the potholes southwards on EN1, back to the turnoff to Mabote at Mapinhane. From there the road was fairly good gravel to Mabote. The countryside became a lot drier as we progress westwards, but still very beautiful. The trip took a day and a half and was over 500 kilometers. Herder on his way home. Suddenly after leaving Mabote, while wondering what the fuss about this route was, we came across a small signpost to Pafuri to the right and the road literally disappeared! It turned onto a two spoor sand track which drifted from the indicated GPS route frequently as it made its way from village to village. A new telcoms cable was been installed along the route and we followed it confidently. The GPS route re-appeared from time to time which gave us the assurance we were following the correct route on this section of track between Mabote and Machaila. We only met one other vehicle, a young couple from Lesotho, on their way to the coast. Both parties were grateful as it confirmed we were on route! The road from Machaila to Mapai seem as if it was being prepared for an upgrade. New culverts were being built the entire distance causing huge humps, as if a new raised road would be built between the humps. This section of road longside the Parque Nacional de Banhine becomes flooded during the rainy season, as does the National Park. It was almost nightfall so we started to look for a suitable place to wildcamp for the night. There were no villages and therefore no chiefs to ask if we could stay overnight. The courteous way! After a wonderful supper cooked on gas we experienced a tranquil night with a stunning milkyway to keep us company. There was the occasional bakkie passing by as well. The next morning we found a village nearby to our surprise! When enquiring as to the route conditions on DriveMoz I was asked whether I had a snorkel!! The river never even wet my rims! The road between Mapai to Pafuri was stunning. We’d never expected such a varied and beautiful landscape. And a final few thoughts from Twiga…..
Our intended route was to go all the way up the east coast and enter Mozambique at the Ponta do Ouro border. We left home as a new cold front arrived, bringing extremely cold and wet weather, which accompanied us to Wilderness. We camped the night at the SAN parks Ebb and Flow resort in the south camp as our favourite north camp was closed. Another annoyance was pensioners discount was cancelled until 20th August due to public holidays. 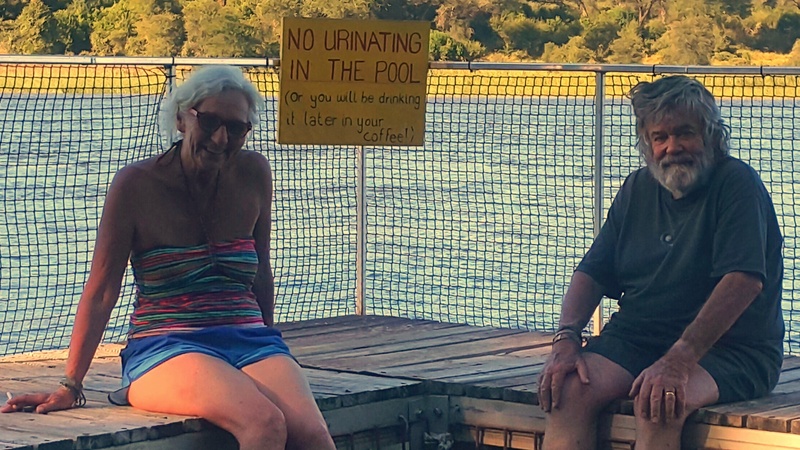 We contacted an old friend from our Randburg days, Eleanor Glover, now living in George, and shared coffee and a “catchup chat” before continuing to Knysna. Margot Paulsen from Gordon’s Bay had recently acquired “The Oaks on Main” centre and was busy leasing premises to new tenants after doing an amazing makeover to the place. The place had been rundown and painted a drab grey. Not everybody in Knysna was happy with her improvements as can be expected. There are always those that detest change in every community. We spent a comfortable night at Woodbourne Caravan park near the Heads where they do apply a pensioners discount. The friendly receptionist asked whether we were birders as they get so many staying there. We said it was surprising that we weren’t as so many of our friends were! Carol and David were on their way to Somerset West the following day and joined us at Oaks on Main for coffee before we each went our separate ways. As we never have any fixed plans we decided to try a drier and hopefully warmer inland route instead and took the Prince Alfred pass out of Knysna through Uniondale to Willowmore. On the way we stopped at “Angies G spot” at De Vlugt in the pass, run by a pair of ageing hippies like ourselves, Angie and Harold Beaumont. We skipped the Road Kill Burger or Jou Pa se Roti and had the coffee instead. They cater for bikers mainly who don’t drink too much coffee I guess, as the coffee was chicory in a plunger! Plaaskind se Kombuis, also at De Vlugt, was closed unfortunately. After the pass we drove through a beautiful poort before reaching Uniondale. While exploring the town we found this beautiful old stone church. We decide to spend the night in Willowmore at the caravan park we’d stayed at a few months earlier instead of staying in Uniondale. That night our wish for better weather didn’t quite work out how we’d wished…A bitterly cold night followed. Fortunately our hotwater bottles helped for part of the night. The morning was a beautifully sunny -2° and water left overnight in the basin was frozen! We visited Sophies Choice, a not to be missed attraction in Willowmore, and enjoyed some real coffee. A number of people we’ve met on our travels insisted we bought lamb pies at Kapoet farmstall if ever in Willowmore. We visited there after Sophies Choice and bought two pies for lunch later in the day. We also bought Marmalade. The marmalade excellent…the Lamb pies… rather give me pies from Peregrines anytime. We’d thought that by moving inland we’d avoid the weather but we were better prepared to handle rain than cold. We had packed clothing for the warmth we expected to find in Mozambique. So back to the coast we went! We studied the map and chose to take the route via Steytlerville and the Gamtoos valley with its citrus farms to Yellowsands, a favourite of ours. The road between Steytlerville and Willowmore. The trip through Grahamstown, Peddie and King Williamstown took longer than we expected and we arrived after dark again! Every night so far! The reception was closed but we knew our way around the caravan park and headed for our usual spot, but it was taken! We left earier the following day, not even visiting the beach which we love so much, wanting to reach Kokstad before sunset! We managed to get ahead of the rain and enjoyed a wonderful drive through the Transkei. Beautiful, sparcely populated, Transkei landscape! It was like being in our neighbouring African countries again whenever we passed through a town. We achieved our goal in reaching Kokstad before sunset! Returning to Stoneybrook B&B and restaurant out of town where we’d stayed with Steinar and Kristin some years before. This time we bushcamped! We took the N2 towards the coast where we’d lost our caravan in the storm know as Demoina (sp?) that lashed Mozambique and Natal in the 80’s when we travelled as a family with our boys, Dukken, Rolf and Birgitte, in our Safari 4×4 and Sprite Musketeer caravan. We both agreed the South Coast has lost a lot of its charm since days spent there at the Zoutendyks in Port Edward. We remembered the many resorts that dotted their way towards Durban, but battled to find a place to stay now. Everything had been replaced by apartment blocks! But that’s progress I suppose. At Karridene we found a Protea Hotel with a lovely caravan park and beach access across the railway line. We were amazed that the Metrorail service actually worked, and with beautifully clean and well maintained coaches, something we had not seen for ages! A visit to Wozo Moya, a previous supplier, was something we always do in Hillcrest. But the main reason for visiting Hillcrest was to visit cousin Ruth and Keith and catch up with family news. We always enjoy the time spent with them. Refreshed and stimulated by the conversation and always something new learnt! We parked our van on their driveway to spend the night. They didn’t even argue with us as they knew we were comfortable in Twiga Penthouse. It was great to enjoy a beautifully prepared home cooked meal, wine and more stories. The following two night were spent in Mkuze. We were really reliving our caravaning days! The last time there Clinton and Haldane made the breakfast. Sven was too young to assist! In camp that night Solveig broke into song! “ Raindrops keep falling on my head….” Something she never did. A monkey was in the tree above relieving himself! and the day spent revising an old favourite haunt was something special. What we thought would be a short trip to what we used to call Kosi Bay turned out to take much longer than expected as our GPS could not find the way. Names had changed since we were there before, but fortunately I knew the way. Finding a campsite not run by the extremely expensive iSimangaliso was another matter. Luckily we spotted a signboard to Palm Tree Lodge which offered camping too. What a find! Wonderfully run by such special, friendly people. A member of their staff, Jan Schoeman, was exceptionally helpful and also turned out to be a very special and interesting person. 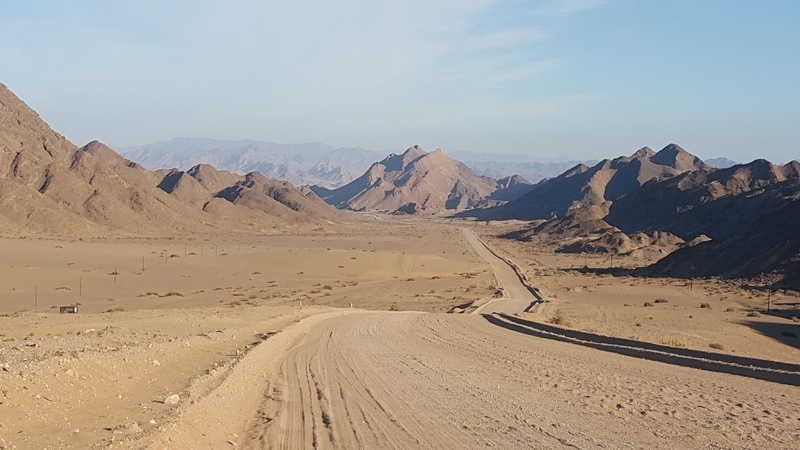 Continue reading "Namibia – In search of the Elusive Desert Elephants"
Namibia – it’s like a virus! We always visit Namibia whenever we are on a long trip. Sometimes even twice! We made good progress through the Caprivi, westwards from our entry point at Katimo Mulilo, and chose to stay at N’Gepi again instead of trying one of the campsites on the Kavango river near Rundu. The SA schools were on holiday and our favourite stands were already taken. We got the Hippo site with wash up area and a good view of the river. The river was very much higher than in January. We stayed for two glorious days and caught up on photo editing and our blog while chilling. Rundu is an odd town that has an infrastructure left behind by South Africa during the bush war and now it’s a mixture of a border town and modern supermarkets and malls. After topping up data and buying provisions we returned to the older African border town section where Solveig bought more chitengas from the stall holders at the street markets. We then continued our trip southwards to Roy’s Camp, nearer to Grootfontein. We love the quirkyness of Roy’s. It was quite full, mostly from South Africa, including a family of first time tenters, that usually caravaned. We watched with amusement as they assembled their camp site. We met Kenyans on their way to Windhoek and had a lovely contact with them also. We could not leave out Okahandja and the Closwa butchery for their fantastic biltong and vacuum packed Namibian steak from our schedule either. We ended up camping there at the Ombonde Campsite, part of the Okahandja Country Hotel just north of the town. One of the nicest camps we’ve stayed at near Windhoek. We visited Windhoek the next day but returned to Ombonde for another night. In Swakopmund we tried out the Mile 4 camp just outside town as we really wanted to be next to the sea again. We’d just completed the crossing of the continent. Mile 4…….Not a campsite to chill at!! 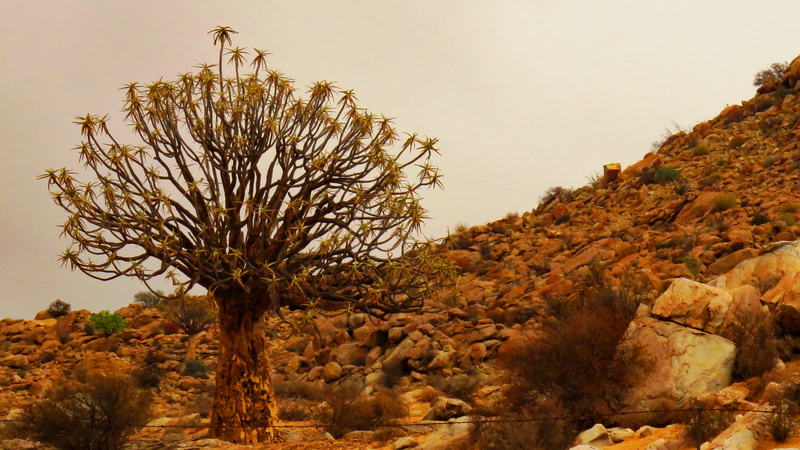 A week had passed since entering Namibia and staying in lovely campsites. Now we chose one of the worst camps we’d ever stayed in! It looked like a cemetery. Can you imagine how dreadful it gets around Christmas when full! The next day we were off to try our luck in Walvis Bay after looking at alternative places in Swakopmund. Alte Brucke was fully booked. The only place with space available was over R500 per night to camp! We enjoyed our day at the Walvis Bay lagoon but the camping wasn’t great there either. We’d made the move from a huge bleak camp in Swakop to a cramped site here. We decided that we’d be far better off wildcamping, so set off into the desert the following day through a dust storm near Walvis. We wanted to camp at Mirabib in the Namib Nauklauft but needed a permit, only obtainable in Swakopmund, so continued towards Sesriem. On the way the dust storm turned into a massive thunderstorm and the rain bucketed down accompanied by lightning and rainbows. The road turned into a river and we had to be extra cautious. The evening light was amazing! By having to slow down because of the rain we realised we’d never get to Solitaire by dark and looked out for a place to stay. The Kuiseb canyon didn’t look too inviting as it was still raining hard and there were no camping signs in all the nice spots. It was evening when we reached the Gaob river canyon and decided we had to camp here. We drove off the road into the river bed and proceeded up stream. The main river had pools of water, and debris from a recent flood trapped in trees about 3 meters above the river bed, so we turned back and drove up a short tributary which was dry. I decided we’d be safe from any storm here. The next morning there was no sign of rain and everything was dry again. 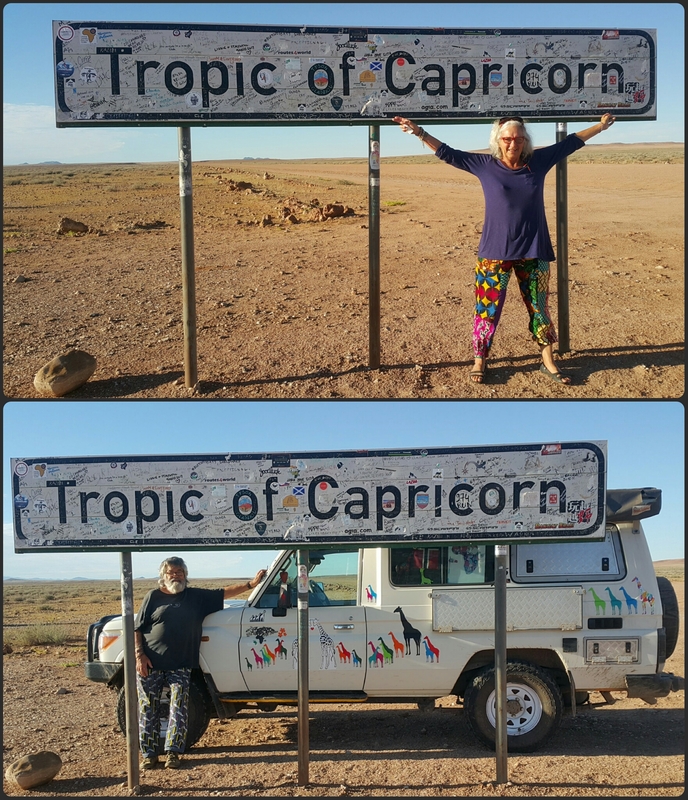 We realised that we had spent the night at the Tropic of Capricorn. Our GPS suggested that we had already crossed the Tropic in the canyon! Joe and Pam Stallebras had stayed at a campsite near to Solitaire at the summit of the Spreetshoogte pass for a few nights and really enjoyed themselves. We were always open to exploring suggestions fellow overlanders made. We headed there after a detour to Solitaire first, as we had plenty of time. The campsite was named Namibgrens. The Spreetshoogte pass is extremely steep and is paved with concrete bricks to assist you with your ascent. On arriving at the farmhouse where we booked in we found this oxwagon which brought back memories of Balfour and the good times shared with our friends Chris and Mandy. I won a photo competition with a similar picture of Haldane about 40 years ago! The campsite was well worth the effort in getting there. There were 12 campsites and a number of chalets too. The camps had individual ablutions located amongst the rocks as well as canvas kitchen shelters and tents, although we chose to sleep in Twiga of course! We spent two night there and most of the day in the rock pool. After leaving we carried on passed Sesriem canyon and Sosusvlei because of the school holidays…We prefered to camp on our own or with just a few campers and hoped to reach Aus that night. Again we drove through the incredible Namibian landscape which we’ve become to love so much. We realised we would not reach Aus so stopped early at Betta near Duiseb where we met two incredible cyclists from Nederlands, Alice and Jaap. They were 68 and 70!! Jaap and Alice. Amazing cyclists! We enjoyed a tea break at Helmeringshausen, and a treat! Namibia is well known for its Apple pie and it was on the menu at the only hotel in the small village, so we ordered two… did we get a surprise when we got the bill…R50 each for the pie and there was no cream either, just castor sugar! 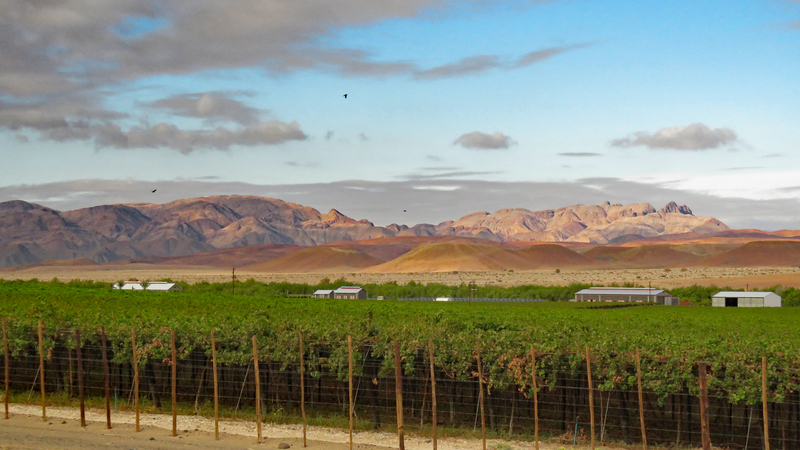 Another day enjoying the beautiful landscapes…. There were animals along the route too…..
We arrived at Aus too early so we continued towards the Gariep River on the border instead. 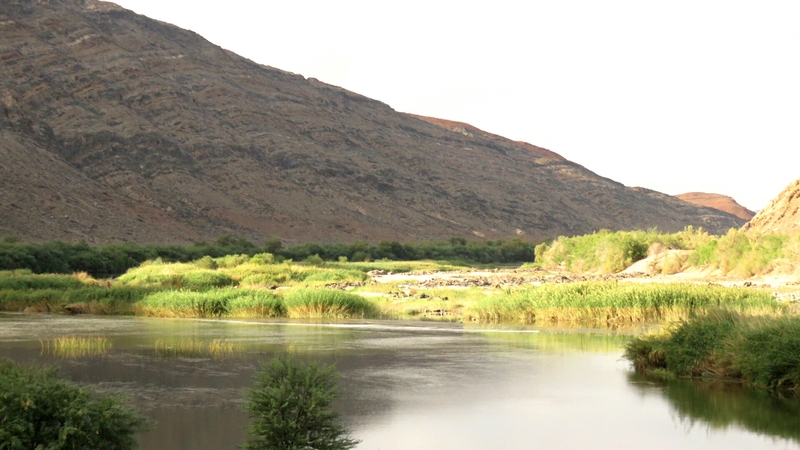 We wildcamped in an abandoned campsite along the Gariep. There are not too many places one can do that anymore, especially during school holidays! Just another 50 kms to Noordoever and a Wimpy breakfast! After breakfast, a quick and efficient border crossing followed by Springbok! Our first morning back in South Africa! Author Ian & Solveig's Overland AdventuresPosted on Apr 22, 2017 Jun 1, 2017 Categories Uncategorized4 Comments on Namibia – it’s like a virus! Zambia – Our homeward journey really begins…. At the Zambian side of the border near Chipata we were about to drive off when a traffic official pulled up alongside and asked if we had obtained our municipal road tax. We’re still not sure whether this is a legitimate tax. This is in addition to the road tax all foreign registered vehicles have to pay and has nothing to do with your Carnet either. We detoured the 130kms from Chipata to the South Luangwa GR, one of our favourites. Our first night was spent at the Croc Valley campsite outside of the reserve on the bank of the Luangwa river. We’d never seen the river so high and we were told it had been at least a metre higher! So peaceful to be back, except you had to be alert to avoid been harassed by monkeys. We visited Tribal Africa again. Their showroom is so beautifully put together. Besides the fabric and smalls which they handpaint and manufacture on the premises, there’s a small curioshop. Even goods from South Africa are on display, especially the Kapula candles and pottery range from Bredasdorp. Solveig bought a few chitengas from the stalls in the village nearby before we moved to Wildlife Camp, our favourite. We’re not sure why we always still return to Croc Valley, but I guess it was the first camp we chose many years before…. The sand bars usually covering a large part of the river were now submerged and only a narrow part close to the bank was exposed. We watched a Yellow Billed Stork in the shallows endlessly searching beneath the surface for food and could have stayed there forever. You become so relaxed and at one with nature in a place like this. Our next stop at Bridge Camp, also on the Luangwa river halfway to Lusaka, was not as relaxing. Since we were last there the wife of thè owner had died from emphysema. It is understandable that the camp now needed lots of TLC. although the quirky ablutions were still the same and gave us plenty of hot water. We met two young couples who were both travelling by bike! Dave and Heather, Canadians on BMW water cooled 800cc motorcycles. and Australians from Melbourne on mountain bikes. We returned to Lusaka, stayed with Kate and Ginty and had the car serviced with Dan once again. Ginty was very busy at work so we never stayed long. We had heard of an alternate route from Lusaka to Sesheke via the Kafue game reserve which would avoid the bad sections of road between Lusaka and Mazabuka and Livingston to Sesheke. Ginty confirmed that it was good tar all the way. We decided to take this route, new to us, even though it would add about 230 kms to the distance. We looked forward to the Kafue game reserve and also the new tar road from Mongu to Sesheke following the Zambezi southwards. In the reserve we stayed at a private lodge and campsite, Kasabushi, on the bank of the Kafue river. In paradise once again! The young British owners, Andy and Libby Wilson, joined us at our braai in the evening. They had created such a special place and also had a number of chalets a, each with its own private river frontage. There are so many amazing places to experience in Africa we feel it’s not necessary to travel anywhere else. In Mongu the most beautiful sight awaited us. The Zambezi was spread out for miles across, with countless islands. Part of the Barotse plains, and the fact that the Zambezi was so full it had burst it’s banks. Our last night in Zambia was spent camping at Ngonya Lodge and Campsite. It’s located imediately after crossing the Zambezi on the brand new bridge near to Sioma and the Ngonya falls. The new bridge has replaced the ferry service which previously transported traffic across the river. The Ngonya Lodge is beautifully situated overlooking the Zambezi. The road from Senanga to Sioma and the Ngonye falls was so new it was not on Tracks 4 Africa. Another bonus for using this route was the absence of trucks. Definately a route to consider. Especially if you are also visiting the Luiwa and the Barotse plains too. We made our border crossing into the Zambezi region in the Caprivi really early and decided to continue on our journey instead of our usual stay in Katimo Mulilo…. Author Ian & Solveig's Overland AdventuresPosted on Apr 13, 2017 May 21, 2017 Categories UncategorizedLeave a comment on Zambia – Our homeward journey really begins…. The border experience was far better than on the previous visit. Better control was in place and the touts had been prevented from entering the official area. Everything was dealt with quickly and efficiently and it was wonderful to be back. However there seemed to be more police checks than before. Many of the small towns we passed through had a barrier. Police were friendly but at one of the stops, after chatting, he mentioned he was hungry and wanted something to eat, or some money to buy something to eat! We were shocked by his statement and replied that he was lucky to have work and could surely afford to buy his own food. The begging left a bad taste. The incident didn’t change our overall impression though. We just love Malawi and it’s people and wonder why more South Africans don’t visit. 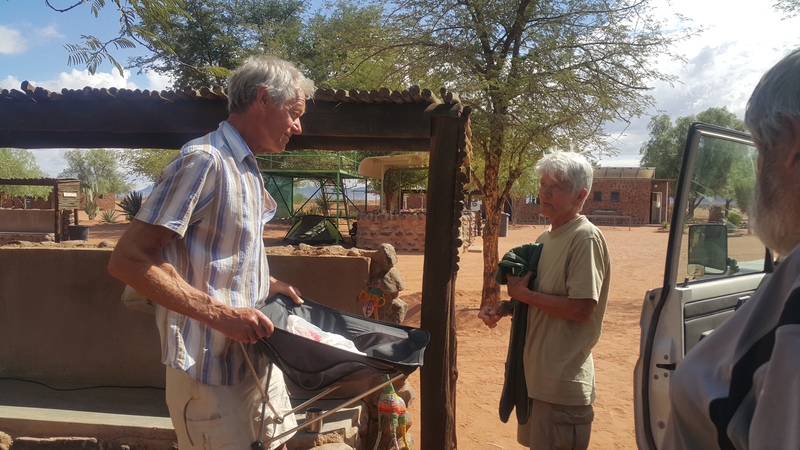 We returned to Hakuna Matata where Willie, an ex South African from Pretoria, and Maggie, who has since sadly passed away, used to run the place. Willie was both sad and angry. Angry as he felt Magie might not have died had she been treated in a better medical facility. It was good to chill again after our long drive through Tanzania and enjoy our chats with Willie and his assistants, Martha and David. We stayed there for two days and nights. On the beach we found this young soccer fan who’d made his own ball from plastic bags! Later, we passed through a plantation of rubber trees on our way to Makuzi, and a young man on the side of the road selling balls he’d made from the latex, and it reminded us of the boy at Hakuna Matata. We visited Chitimba next door to Hakuna Matata to see where Scott and Helena had managed the camp while the Dutch owners, Carmen and Ed, were visiting family in Holland. Theit camp is more upmarket and chic than Hakuna Matata. The chalet is mounted on springs ! The weekend after we visited, Chitimba was hosting about 100 cyclists riding from Cairo to Cape Town in the Tour d’Afrique. A pity we missed them! We bought some Mazuzu coffee beans for home, and ground coffee for the rest of our trip, at a coffee shop in Mazuzu on our way to our next campsite. Makuzi Lodge and Campsite was on the lake about 60 kms south of Mazuzu. With its magnificient beach it is one of the best places to stay on the coast. Be sure to book, especially if you are camping during season and not staying in a chalet, as there are only three campsites and 11 chalets. Beautiful granite rocks are all over the site. We decided to chill awhile before our homeward journey and chose to return to Peponi Beach resort, where we stayed for nearly two weeks in 2014. When last at Peponi, the owner Denis, was in the final stages of selling the resort. New owners are from Kenya and it’s now being managed by their daughter, Claris. And what a fantastic job she is doing. It’s hard to imagine how one can improve on paradise, but she has managed to do that! Part of the makeover at Peponi. The vegetation around the pool has been cleared opening a view to the sea. Our friends, Michael and Birte that we met at Tiwi Beach arrived the next day before their trip to Zanzibar, but we still never had that Pinacolada! We just loved our walks on the beach at low tide…..
Who said that Baobabs can’t grow at the seaside? We walked to Pangani, a small fishing village south of the camp and also north to the mangroves. After only five days we moved on again unfortunately. We’d made the decision to include Malawi on our return journey and we needed to make time for that too. After a long drive we stopped over at Tan Swiss in Mikumi for the night. The drive there was stunning. Even the 50kms through the Mikumi game reserve was fruitful and we sighted many animals. Another long drive to Mbeya followed. The scenery in this part of Tanzania is so wonderful that it makes the journey so much easier. The Valley of Baobabs on the banks of the Ruaha river and the beautiful mountain pass through the Uzungwe forest are unique. We arrived in Mbeya after sunset and drove the last 30kms or so in the dark. That we knew the area hardly made any difference to the difficult and risky task. Rush hour in this part of Africa consists of unlit bicycles, darkly clothed black pedestrians, handcarts returning from markets. And trucks stopping at each and every speedbump, not to mention the roadworks and potholes! The first thing we did on arrival was down much deserved drinks! Creatures of habit that we are, we returned to Utengule Coffee Estate for the night where we experienced problems with the camp electricity supply. It damaged the mains adapter for our fridge which is an inconvenience as the fridge can now only operate when the car is moving. As it was already late we decided to treat ourselves to supper in their restuarant. We weren’t hungry so ordered a light meal each which was dissapointing. We should have shared a good main meal instead. And motorcycles, the main mode of transport! Although we were looking forward to visiting Malawi again we sadly said goodbye to Tanzania in the morning, one of our favourite African countries.